When sixth-grader Amalia’s best friend, Martha, announces that she and her family are moving to California, the girl is so upset she doesn’t even want to say good-bye. But she receives solace and advice from her wise and gentle abuelita. As they cook together, she takes in Abuelita’s family stories about life, about change, about loss, about grieving. And then, suddenly, Abuelita is gone, too. There’s not even a chance to say good-bye; and, as Amalia’s large family comes together to celebrate Abuelita’s life, the pain seems unbearable. 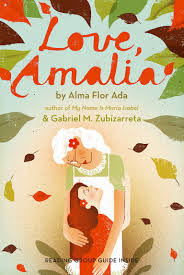 Later, when Amalia’s mother gives her Abuelita’s treasured olive-wood box—full of cards, letters, and drawings from family members over the years—Amalia sees a way to hold on to her memories, deal with Abue’s passing and, finally, say good-bye to Martha. Actually, a more idiomatic interpretation might be, “Don’t die before your time.” The quote above implies that Amalia’s mother is using dichos—a tradition in many Latin American cultures—to instruct her daughter. It also implies that Amalia’s mother learned dichos at her own mother’s lap. Yet this is the only dicho in the story, and it’s called a “saying,” rather than a dicho. Apparently Amalia—whose attitude is dismissive and disrespectful—doesn’t recognize the value of traditional teaching, probably because her abuela, the one person whose wisdom guides her, doesn’t teach through dichos. She heard over and over, people telling her, “¡Ay, querida! Oh, sweetheart.” Her aunt and uncles hugged her, and Tía Graciela insisted on kissing her. “Lo siento tanto. I’m so sorry.” “Lo sé. I know,” she would say to remove herself from almost any situation. … Abuelito’s father, our great-grandfather Nicolás, had arrived as a farmworker but then decided to open a store. Abuelito’s mother, María, had been working in a garment factory. But it was hard work in those sweatshops, and Abuelito felt that if they worked together in the store they could make it succeed. And they truly did. In another place, after a mention of Zapata’s mustache, there’s an unnecessary explanation: “Emiliano Zapata was the leader of the Mexican Revolution whose photo Amalia had seen in a book about the history of Mexico.” And there’s an almost two-page description of the history, geography and population of Mexico City that reads like it was plucked from a travelogue. Finally, the authors rely on platitudes that “tell” rather than “show,” such as: “It all seemed very unjust, and it filled her with anger just to think about it,” “Her eyes were still moist with tears, but there was a new warm feeling in her heart,” and “Moments like this made their friendship so special.” Love, Amalia is not recommended.